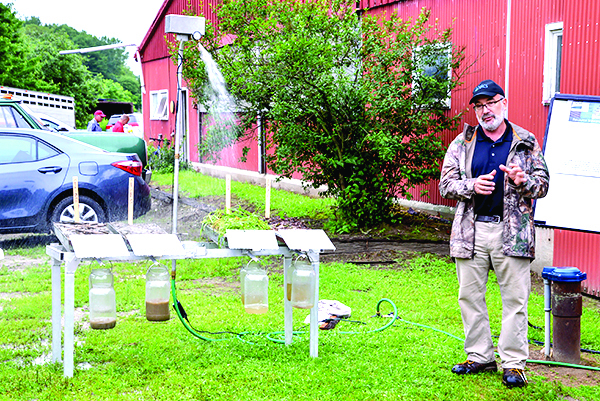 Danny Peet from the Williston office of the National Resources Conservation Service (NRCS) explains how the “rainfall simulator” shows how much absorbtion and run-off rates vary with soil conditions. Williston’s Whitcomb farm held up as example of environmental stewardship Gov. Phil Scott came to Williston last week to launch a state certification program to recognize farmers who are committed to environmentally friendly agriculture and natural resources protection. The Vermont Environmental Stewardship Program will analyze and monitor soil to identify farmers excelling in environmental land management. 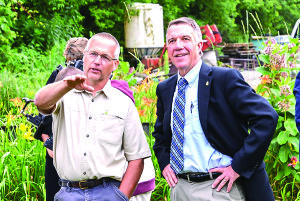 Scott was joined by officials from the Vermont Agency of Agriculture, Food and Markets; the U.S. Department of Agriculture; the Vermont Association of Conservation Districts; the Vermont Department of Environmental Conservation; and the University of Vermont Extension. They gathered at North Williston Cattle Company, owned by the Whitcomb family of Williston. Vermont Agriculture Secretary Anson Tebbetts said. The Vermont Environmental Stewardship Program is a state response to water quality and environmental challenges. 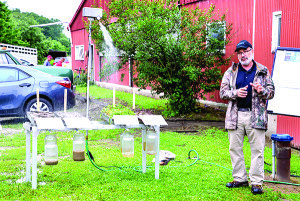 Its goal is to accelerate water-quality improvements through voluntary efforts. To be certified, applicants must meet environmental standards regarding nutrient management, sediment and erosion control, soil health, greenhouse-gas emissions and carbon sequestration and pasture health. Successful applicants will be awarded with a five-year certification. Unsuccessful applicants can work with the program on a plan to achieve the standards.